GibGab is a professional networking mixer consisting of two parts: a series of threeminute individual meetings with member companies, and an informative Q&A Session with industry experts. During the company meetings, NextGen members introduce themselves and their work to the TEA member companies in attendance. The Q&A allows NextGen to learn about best practices in the industry from experienced Themed Entertainment professionals. NextGen tickets are $10; Company Tables are $150. 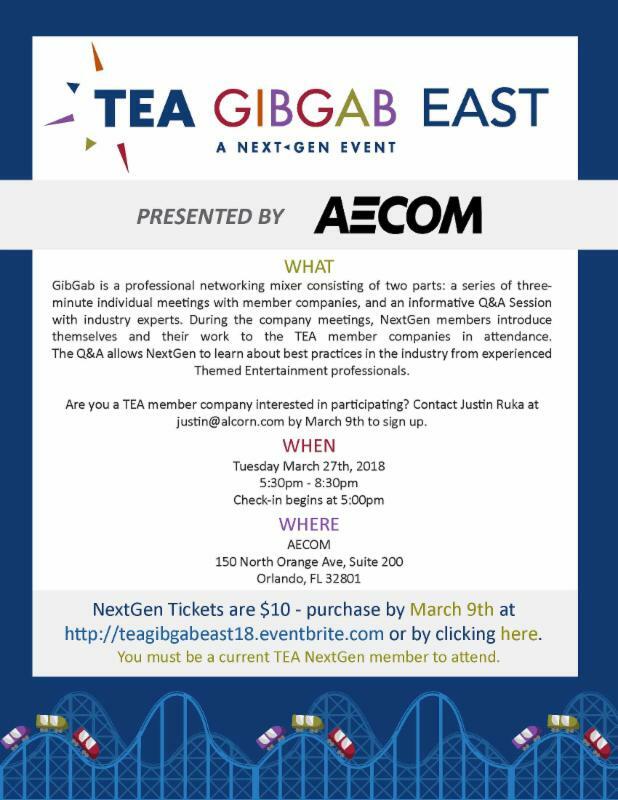 You must be a current TEA NextGen or company member to attend; membership will be checked and confirmed prior to the event. Registration is limited and likely to sell out quickly. Do I have to be TEA NextGen member to attend? Yes, this event is exclusively for TEA NextGen members to meet with TEA companies. Only with approval from the event organizer. For TEA NextGen members, the name must match. For companies, any employee from your company may attend.